The QA Station has been designed for a major international client working in the nutrition sector. The station is designed to be a work area with the facility to locate and securely store a test bath, 2 off pc workstations and scales for the inspection and data logging of products. The QA station has been fabricated from 25mm x 25mm box section and 1.2mm cold rolled sheet. The internal panels are produced from 1.2mm cold rolled sheet and have RAL 6019 protective laminate attached to them. 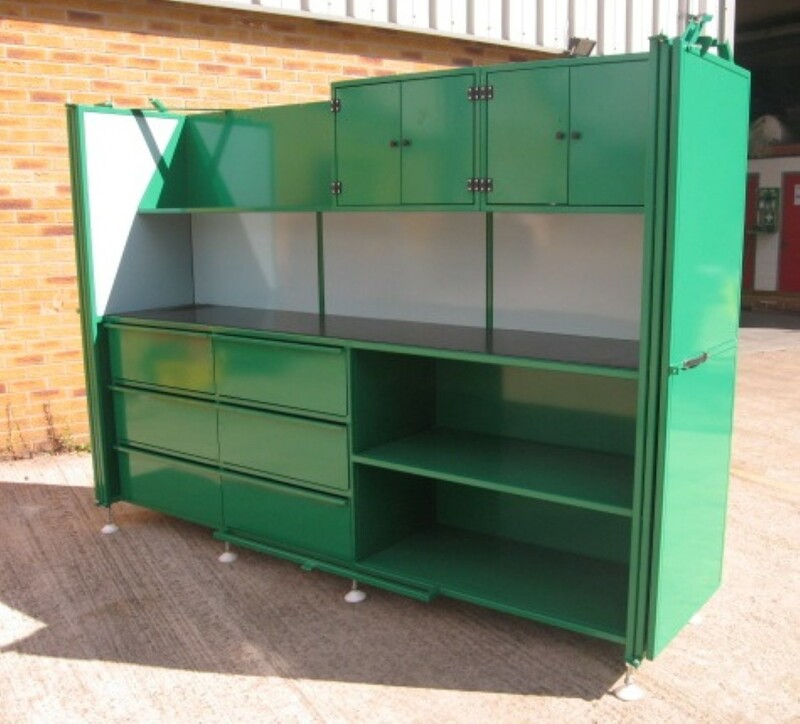 The back and side panels are manufactured from 1.2mm cold rolled steel and are riveted on. The unit features 6 off drawers fitted with ball bearing slides. The stations are fitted with heavy duty adjustable feet as they do not need to be moved once installed. The front of the QA station features 2 off lockable bi folding doors which fold back flat against the sides with a drop down latch to hold the doors back. The desk top section of the work station has been set back 75mm to allow for tool storage on the inside of the doors when closed. The inside of the station has a shelf on the left hand side 400mm from the top and 300m deep which goes to the middle of the station. On the right hand side there are 2 off cupboards 450mm from the top and 400mm deep. Finally the station has been powder coated in RAL 6029 to give a long-lasting and durable finish. Approximate overall size 2500mm (W) x 1800mm (H) x 600 (D) Work surface height 900mm.